What is a Pre-Birth Order, and Why is it Important? A pre-birth order is a court order signed by a judge establishing the parentage of an expected child when the woman giving birth is a gestational surrogate and is not genetically related to the child. Without a pre-birth order, the surrogate’s name would be placed on the birth certificate since she has given birth, and additional legal steps would be necessary to establish the intended parents’ legal rights to their child, such as an adoption or amendment to the birth certificate. Fortunately, the experienced attorneys at Parker Herring Law Group, PLLC are able to obtain a pre-birth order in most North Carolina surrogacy cases. Read on to learn more about this important pre-birth process and the services Parker Herring Law Group, PLLC offers to help you establish parentage of your child. But, while this definition seems simple enough, parentage in the context of surrogacy can be more complicated. How do you determine legal parentage in assisted reproduction? With the rise of modern family-building methods like gestational surrogacy and egg and embryo donation, parentage isn’t always as simple or clear as it once was — but it’s still just as important to protect families and children. The Uniform Parentage Act presumes that a woman who gives birth to a child is the genetic mother of that child; if she is married, her husband is presumed to be the father of the child. No doubt there have been many times when this presumption was wrong with regard to the husband being the father; until recent years and the advances of modern science, it was never wrong as to the mother. 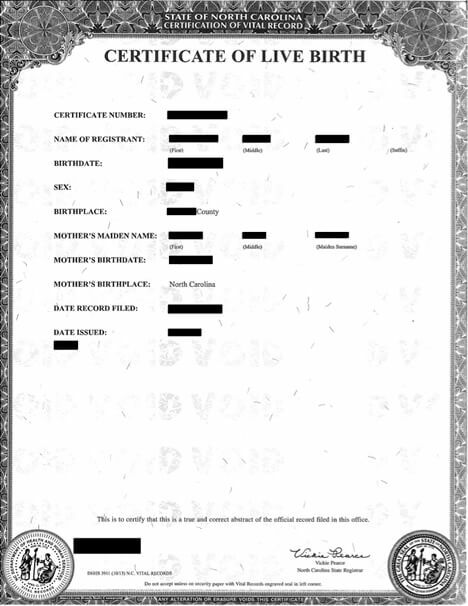 The child’s birth record will identify the woman and her husband as the parents of the child. But what if it’s not their child? Because of the Parentage Act, additional legal steps are required to provide proof of parentage in a surrogacy arrangement. When intended parents follow these procedures to establish parentage, they can ensure that they are listed on their child’s original birth certificate and that they have all legal rights and responsibilities for their child. The hospital must assume the child’s parents are the surrogate and her husband. Obviously, they cannot just accept statements from the parties involved that the child belongs to the intended parents. How is this overcome? The solution: a pre-birth order. The pre-birth order process typically begins around 20 weeks into the surrogate pregnancy. This allows time for the attorneys of Parker Herring Law Group, PLLC to obtain all the required affidavits and file the pre-birth order before the child is born. 1. Signed affidavits are obtained from all parties. Your attorney will draft affidavits for all parties and will send them to you for review. The affidavits will state how the child was conceived and whose genetic material was used. If you are satisfied with the affidavits, signed copies will be obtained from you, your fertility doctor and the surrogate and her husband, if she has one. 2. A complaint is filed with the court. To place any matter before the court, a party must file suit against another party. The intended parents file a complaint in which they are the plaintiffs and the surrogate and her husband are the defendants. Your attorney will prepare the complaint after receiving the original, signed affidavits from all parties. This complaint begins the legal process so that an order can be issued. 3. The complaint is served on the defendants. Like any other lawsuit, the defendants must be served with the lawsuit and allowed time to respond. Filed as exhibits to the complaint are the sworn affidavits stating the affiant’s understanding and belief as to the parentage of the child. The matter is then before the court and may require court appearances before a judge signs an order. 4. The court executes a consent order. Your attorney will guide you through the process to obtain the judge’s signature on the pre-birth parentage order. 5. The order is forwarded to the hospital. If a judge signs the order, it is then presented to the hospital where the surrogate will deliver the child. We suggest that the intended parents as well as the surrogate provide a copy of the order to the hospital upon admission. The hospital is ordered to put the names of the intended parents on the birth certificate. Additionally, the court orders the intended parents be given identification bracelets, unrestricted access to the child and immediate custody of the child. While this legal process may seem daunting, it is important to remember that in many ways, it is simply a formality; you and your surrogate signed a surrogacy agreement before beginning medical procedures, and all parties already understand and agree on the desired parentage of the child. While pre-birth orders are generally available in North Carolina surrogacy cases, it is important to understand that this surrogacy and prebirth orders are still considered an unsettled area of law in North Carolina. Additionally, not all states permit pre-birth orders for surrogacy, and in many states, the availability of a pre-birth order may vary from county to county. If the state or local courts do not permit it, or if the pre-birth order is not signed prior to the child being born, a post-birth order must be obtained. In the alternative, the intended parents may have to formally adopt the child. In this video, Parker Herring discusses pre-birth orders in North Carolina. Herring is a founding member of Parker Herring Law Group, PLLC and has practiced in Raleigh and Wake County for over 31 years. A significant part of her practice is devoted to surrogacy and assisted reproduction as well as adoption. Her third child was conceived using advanced infertility procedures. Parker Herring Law Group, PLLC has guided many individuals and couples through the pre-birth process. Obtaining a pre-birth order in North Carolina can be complicated, and the rules must be carefully followed. For intended parents, a pre-birth order not only eliminates any custodial issues before the child is born, but also saves them the significant expense that comes with adoption. An experienced attorney is crucial to successfully obtaining a pre-birth order. For more information on obtaining a pre-birth order, contact us at 919- 821-1860. We represent individuals and couples in need of legal representation in all family law matters, including surrogacy, egg donation and pre-birth orders. Parker Herring Law Group, PLLC is a full-service Raleigh family law firm handling adoption, divorce, separation, child custody and domestic violence. Contact us today to speak with an attorney about how we can help you.